I've always been a bit hesitant to jump on any sort of new technology bandwagon. I refused to buy dvd's until they stopped making most movies on VHS. I didn't want to buy a digital camera because I liked getting film developed. I kept my old school - tough as nails - dropped it in a pool and it survived - cell phone as long as I could. Now it's Facebook. 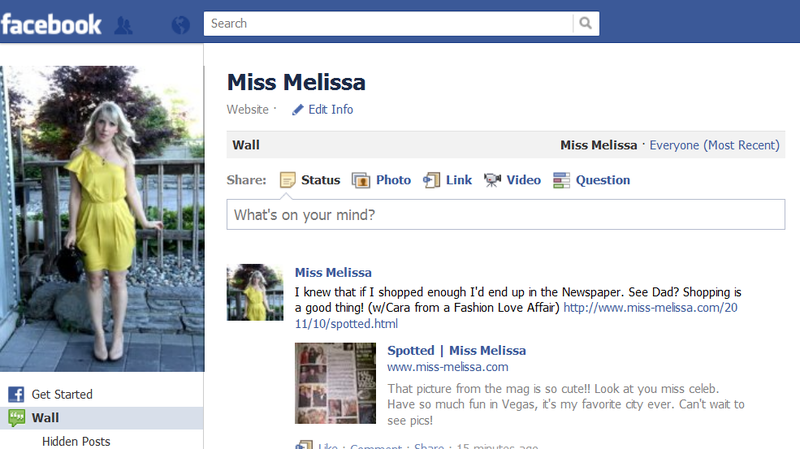 I follow so many blogs on Facebook but for some reason I didn't have my own page... until now. Now I have my very own real life Miss Melissa Facebook Page. Stop by and "Like" my page for updates and fun extras (outtakes, photos that don't make it on my blog etc). Visit my blog, and if u want we can follow each other!! Great job on getting a facebook page! It's definitely a good move for a blogger to make! Let's follow each other and 'like' each other on facebook too! it's a big step! good for you! Congratulation on making your facebook page! Do you have a facebook fan page?